There have been several recent cases of cats being returned to the rightful owner following a scan for a microchip. It would eliminate a lot of heartaches if a cat was scanned immediately instead of just assuming it doesn’t have an owner. The first thing a cat owner usually does when their cat doesn’t come home at night as is customary is to start a search for the cat. The owner will likely turn to social media and puts up flyers in the neighborhood with information about their missing cat. Over the past year, I’ve covered many cases where the cat is found a LONG distance from home. Sometimes a VERY long distance. 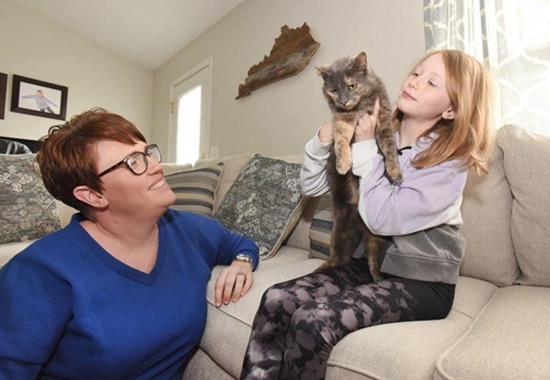 The lost kitty may be fortunate enough to have a new caregiver who has no idea the cat is lost and a family is heartbroken. Cats who have been lost for years finally find their way home when a microchip is eventually scanned. A lost cat named Gibson is a good example. Stacey Higdon was contacted by a veterinarian about two weeks ago after someone brought the cat in to be spayed. The person waited a year to take Gibson in to be spayed and a microchip tattoo was found. The person who had taken Gibson in and provided a home for over a year was very unhappy at having to give Gibson back to the rightful owner. Microchips are often required to prove legal ownership of a cat, with some cases even going to court. A cat named Bella was returned home much quicker than Gibson because the lady who found Bella had brought her in to check for a microchip. A feral colony caregiver had found the lost kitty at a decaying fireworks building near the foot of the Glover H. Cary Bridge. Bella had somehow crossed the river. Owner Lindsey Hobbs was surprised when Daviess County Animal Shelter called her to report Bella had been found in Spencer County. She had resigned herself to the thought Bella had likely wandered off and been hit by a car. If you find a stray cat, please take it to any veterinary clinic, animal shelter or humane society. Chances are they’ll have a microchip scanner and do a check free of charge. There are microchip clinics in many areas where the service is offered for a very small cost. It gives a pet the best chance possible at being returned to the family should it go missing. And since chips may move around in the body it’s a good idea to have your vet scan for the chip during the yearly checkup. This entry was posted in lost cat and tagged cat reunited with family, human to cat relationship, microchipping cats, The Articles of Elisa Black-Taylor by Elisa Black-Taylor. Bookmark the permalink.